…or Power Map directly on tabular instance,simply like power view. glad to know that I'm not alone! Bob, why so? What issues did you face? In short l want to demonstrate the same principal you have shown with the american states for regions in the UK. The various combinations l have tried do not work, for example United Kingdom, South West is not mapped. So far my goggling has not found any information or any suggestions. It might not be supported for any country other than USA, ok fair enough, could someone tell us this? Yes cities do work, however l want to level of granularity above this. The map tiles that displayed in the back ground are yes downloaded from the Bing map service which is public. Apart from a possible issue with the port (maybe) it uses to download there should be no issue. The demonstration shown above can be run locally from an excel spreadsheet. it does not have to be hosted on a Power BI. The power map feature is part of Excel 2013 (check the edition to ensure you have the right one) or Office 365 again check the version you need. Hi Jason – I installed the Power Map Preview from the Microsoft website, and it shows in my Excel ribbon. However, when I try to use the map add-in I get an error message that says, “Cannot initialize DirectX. Confirm that your hardware supports DirectX 10 or later and that you have the latest video card driver installed.” I have checked both of those items, which seem to be in order. 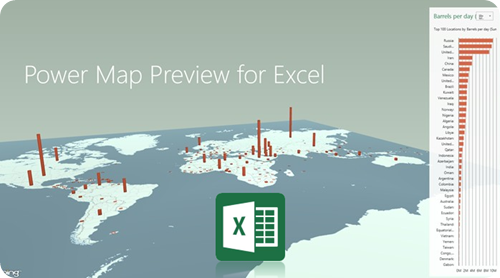 Does the Power Map Preview version still work in Excel 2013? I do not have Office 365, so I cannot use the regular version. Thank you for your help! Can you look at your graphic options? Try changing the graphics / power options to High performance and see if the problem still persists. I thought I heard someone resolve this issue by turning on/off Accelerate 3D Graphics option also.